When you walk into the offices of the American Legislative Exchange Council, it’s hard to imagine it is the birthplace of a thousand pieces of legislation introduced in statehouses across the county. Only 28 people work in ALEC’s dark, quiet headquarters in Washington, D.C. And Michael Bowman, senior director of policy, explains that the little-known organization’s staff is not the ones writing the bills. The real authors are the group’s members — a mix of state legislators and some of the biggest corporations in the country. “Most of the bills are written by outside sources and companies, attorneys, [and legislative] counsels,” Bowman says. Here’s how it works: ALEC is a membership organization. State legislators pay $50 a year to belong. Private corporations can join, too. The tobacco company Reynolds American Inc., Exxon Mobil Corp. and drug-maker Pfizer Inc. are among the members. They pay tens of thousands of dollars a year. Tax records show that corporations collectively pay as much as $6 million a year. With that money, the 28 people in the ALEC offices throw three annual conferences. The companies get to sit around a table and write “model bills” with the state legislators, who then take them home to their states. 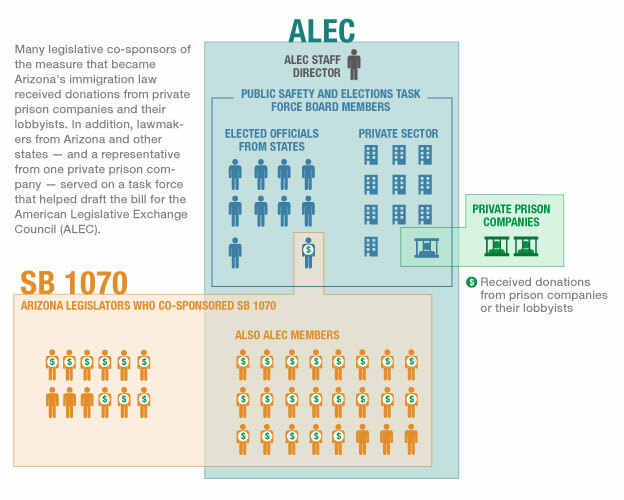 Each of these state legislators sat on the ALEC Public Safety and Elections Task Force, which drafted language of a bill that became Arizona’s SB 1070. Former Staff Director of ALEC and Public Sector Chair. If re-elected, Ray plans to co-sponsor a bill in Utah similar to Arizona’s SB 1070. Has attempted to pass immigration-related bill, but would not support a bill identical to Arizona’s SB 1070. ALEC’s Bail Bond Subcommittee Chairman. Lost the Republican primary to a political newcomer. Suder is very supportive of having a Wisconsin law modeled after Arizona’s, as long as it is ruled constitutional. Signed amicus brief in support of Arizona’s SB 1070, filed in September, 2010, in the U.S. Court of Appeals for the Ninth Circuit. 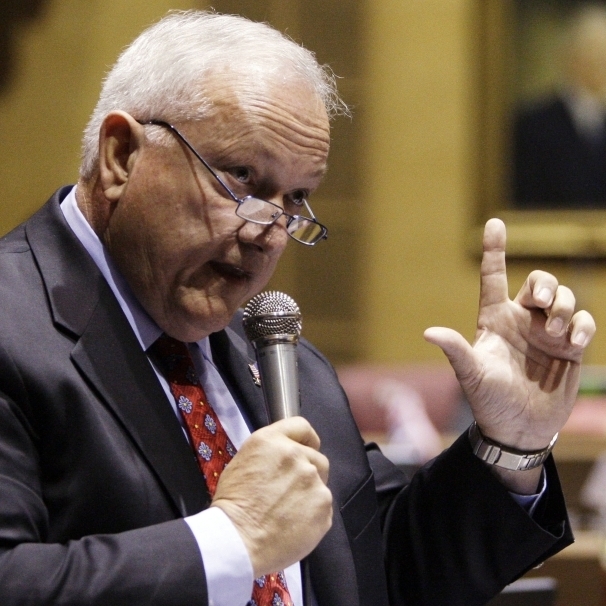 One of those bills is now Arizona’s controversial new immigration law. It requires police to arrest anyone who cannot prove they entered the country legally when asked. Hundreds of thousands of illegal immigrants could be locked up, and private prison companies stand to make millions. ALEC’s Bowman says that is not unusual; more than 200 of the organization’s model bills became actual laws over the past year. But he hedges when asked if that means the unofficial drafting process is an effective way to accelerate the legislative process. The difference between passing bills and “finding” them is lobbying. Most states define lobbying as pushing legislators to create or pass legislation. And that comes with rules. Companies typically have to disclose to the public what they are lobbying for, who’s lobbying for them or how much they are spending on it. If ALEC’s conferences were interpreted as lobbying, the group could lose its status as a non-profit. Corporations wouldn’t be able to reap tax benefits from giving donations to the organization or write off those donations as a business expense. And legislators would have a hard time justifying attending a conference of lobbyists. Much about ALEC is private. It does not disclose how it spends it money or who gives it to them. ALEC rarely grants interviews. Bowman won’t even say which legislators are members. An analysis of documents and records show that private prisons helped draft and pass the measure. Videos and photos from one recent ALEC conference show banquets, open bar parties and baseball games — all hosted by corporations. Tax records show the group spent $138,000 to keep legislators’ children entertained for the week. Kirk Adams, Arizona’s House speaker, went to ALEC’s most recent gathering in San Diego. “I have been to ALEC’s conferences and they have been pretty educational — the ones that I’ve been to,” he says, adding that the time he spends with corporate executives does not influence his opinions on the issues. 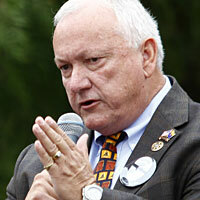 Ross D. Franklin/APArizona state Sen. Russell Pearce speaks in April during a vote on SB 1070, the immigration bill he sponsored. The final version resembled “model legislation” he helped draft during an ALEC conference in Washington, D.C., last year. Many ALEC members receive these scholarships. But it’s not clear who’s really paying. Michael Bowman initially said state Sen. Pearce, who also accepted a scholarship, would know who paid for his trip. But the Arizona lawmaker said ALEC paid for it. 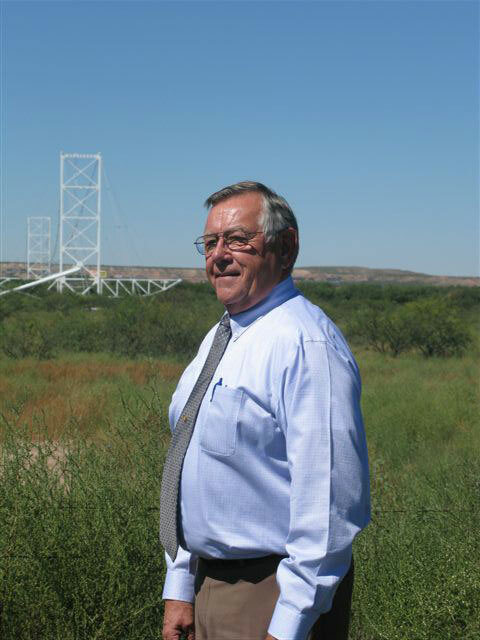 Later, Bowman said Bob Burns, another Arizona state Senator, would know. Burns was in charge of pooling money for the scholarships. He did not respond to NPR’s repeated requests asking where the money came from. 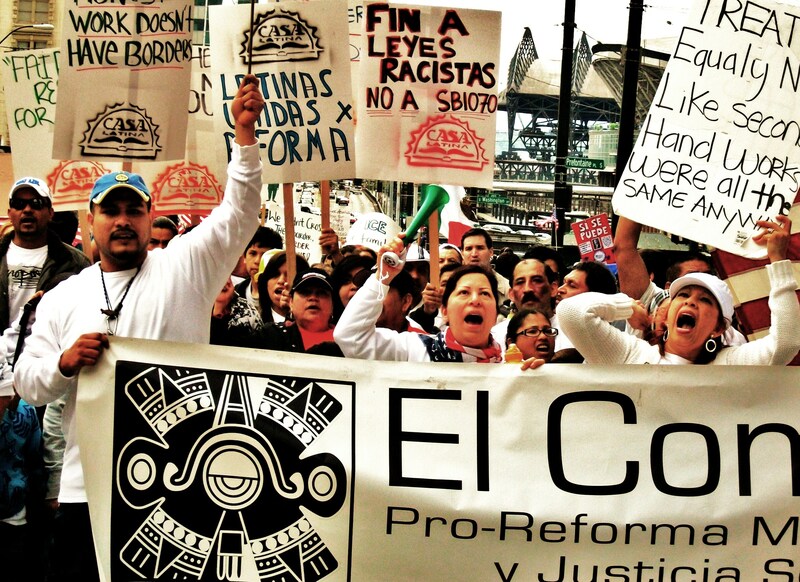 A review of the two dozen states now considering Arizona’s immigration law shows many of those pushing similar legislation across the country are ALEC members. Since Arizona Gov. Jan Brewer signed SB 1070 into law in April, five state legislators have introduced eight bills similar to it. Like SB 1070, four of them were also named “Support Our Law Enforcement and Safe Neighborhoods Act.” Lawmakers in many more states NPR interviewed have said they would introduce or support a similar bill. The prison company didn’t have to file a lobbying report or disclose any gifts to legislators. They don’t even have to tell anyone they were there. All they have to do is pay their ALEC dues and show up. 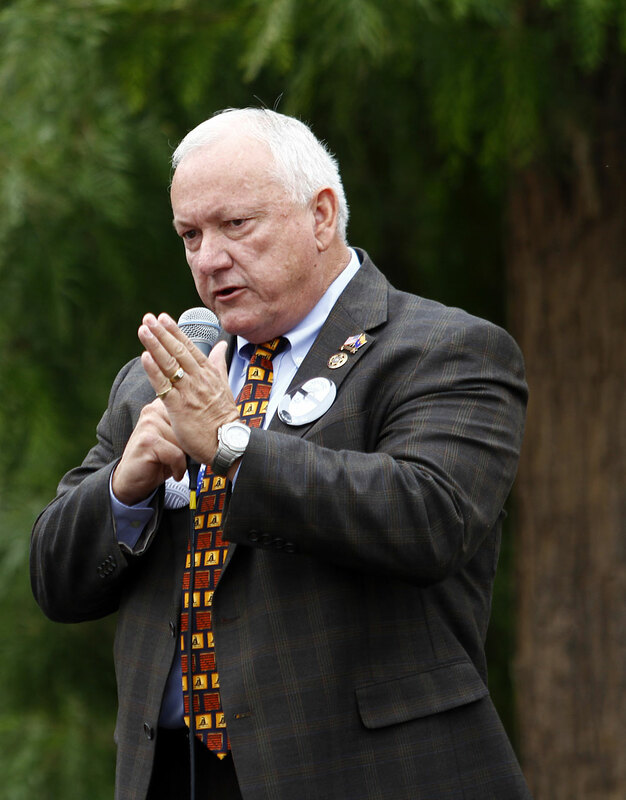 EnlargeJoshua Lott/Getty ImagesArizona state Sen. Russell Pearce, pictured here at Tea Party rally on Oct. 22, was instrumental in drafting the state’s immigration law. He also sits on a American Legislative Exchange Council (ALEC) task force, a group that helped shape the law. As the debate over immigration reform continues, anti-immigrant forces have offered some downrightheinous solutions on how to deal with the issue and policymakers around the country are starting todance to the nativist beat. It’s an old pattern, and it’s not limited to Arizona’s notorious show-me-your-papers law. Many Americans have resisted the flow of immigrants since the country’s inception. And the rhetoric is always the same: they’re taking our jobs, they commit crime, they’re reproducing faster than us, they’re taking over, they don’t assimilate. Xenophobic Americans have, over the centuries, scapegoated nearly every racial or ethnic group who migrated here — Irish, Chinese, Italians, Japanese, African-Americans (few of whom came here voluntarily), not to mention American Indians (who were here first). The arguments coming from the anti-Latino-immigrant brigade are no surprise. Descendents of some of the very populations that were once vilified are now taking their turn to try and exclude another group. Like Barry Wong (son of Chinese immigrants) and Tom Tancredo (grandchild of Italian immigrants), these people — who aren’t native to this country by any means — are now fighting against any sort of logical reforms to the current immigration system because they are afraid the Latinos will take our jobs, commit crimes, take over, and refuse to assimilate into American communities. Kobach is a Harvard/Yale/Oxford-educated Republican candidate for Kansas Secretary of State who’s become a national figure by hiring himself out to state and local jurisdictions to fight for restrictions on illegal immigrants partly on behalf of his employer, the Federation for American Immigration Reform(FAIR). 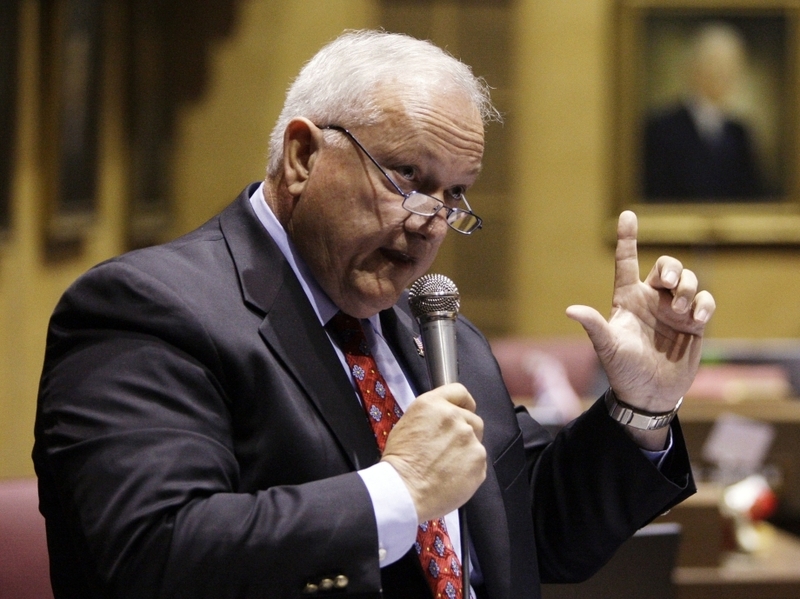 He’s currently at the forefront of the battle in Arizona over the bill he co-authored, SB 1070. But this isn’t his first foray into the immigration policies of cities and states in which he is not a resident. Kobach has inserted himself into local debates about immigration and left millions of dollars in legal debt in his wake. As an advisor to Attorney General John Ashcroft, Kobach “reformed” the Board of Immigration Appeals to such an extent that the number of judges who heard cases was reduced by half, thoroughly overburdening the system. This is a man who struts into America’s communities, convinces them to let him draft legislation, and then runs up astronomical fees to towns with only a few thousand residents. His agenda isn’t to solve any problem with immigration — it’s to make a name and fortune for himself. In wake of polemic debate surrounding immigration reform, the most stringent bill approved at the state level so far, is SB 1070 in the State of Arizona, signed into law by Gov. Jan Brewer. The legislation itself, championed by ultra-right State Senator Russell Pearce with the backing of many anti-immigrant groups was written by a lawyer for perennial anti-immigrant lobby Federation for American Immigration Reform’s (FAIR) legal arm. FAIR is an organization categorized by the Southern Poverty Law Center (SPLC is a legal advocacy organization that tracks hate and extremist groups nationally) as a Nativist Hate Group. Provisions within SB 1070 make it unlawful in Arizona to: work or solicit work without documentation; hire or be hired if person being employed enters a car that is blocking traffic; transport, move, conceal, harbor, shield, or encourage an undocumented person to come to Arizona; and have state agencies restrict enforcement of federal immigration law, among others. Additionally, the bill endows local and state law enforcement with the power to determine a person’s immigration status upon arrest, before the person is released. Likewise, police are able to stop or question a person about their documented status based on “reasonable suspicion,” making the simple act of walking or being out in public without proper documentation a detainable offense. In larger, national parlance, the introduction of SB 1070 has grave implications as provisions are a total affront to civil liberties, human and civil rights, and sets a dangerous precedent in which racial profiling and ethnic targeting are legitimized as law enforcement tactic. According to the AzCapitalTimes.com, a news service that tracks Arizona politics, other states are introducing copycat bills, while others await legal challenges to SB 1070 before they introduce legislation. States taking such action include: Colorado, Georgia, Maryland, Mississippi, Texas, Utah, Missouri, Pennsylvania, Arkansas, Nebraska, Minnesota, Michigan, Nevada, New Jersey, Tennessee, Ohio, Rhode Island, Oklahoma and South Carolina. On July 28th, some of the provisions were momentarily struck down by a federal court judge of which include: the ability to stop someone “suspected” of being undocumented without a warrant; the ban on day laborers’ ability to solicit and perform work; and the requirement for immigrants to carry federal immigration documents at all times. The rest of the provisions under the bill went into effect on July 29th. A partial victory and indeed a very important one. However, the struggle continues to ensure the entire bill is repealed and to quash any anti-immigrant state bills from replication in other states.